Erith, a Breton child, is the daughter of Daighre. She can be found in Left Hand Mine, just outside Markarth. She is quite an innocent child and she does not seem to understand many of the problems in the Reach. This becomes apparent when she asks "Why is everyone so upset? If there's Forsworn, the Jarl will take care of them, right?" She also seems to be sympathetic to Pavo, like most of the town, and she expresses her concern when she remarks that "Hope Pavo will be able to go back to his mine soon. Everyone needs a home." At other times, Erith will make remarks about the miners such as "What'cha doing in Left Hand? Do you dig up rocks too, like my mom?" and "Why do they call it Left Hand Mine? Can the miners use their right hands too?" Erith also looks after her dog and obviously thinks highly of him: "Have you met Torom? He's the best dog in the Reach." She wears child's clothes and a pair of shoes. She carries a key to Daighre's house, a selection of food and toys, and a small amount of gold. 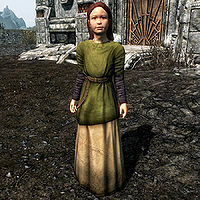 If the Hearthfire add-on is downloaded and Daighre is killed, Erith can be adopted. If she is, her dog Torom will come with her to your house. This page was last modified on 21 November 2017, at 08:10.